Toronto-based real estate services company Avison Young announced Thursday it has an agreement to acquire GVA, one of the U.K.’s most diverse real estate advisory-led businesses. It will combine GVA with Avison Young’s existing U.K. operations. AY is acquiring GVA from Apleona Limited, a portfolio company owned by global private-equity firm EQT. The transaction remains subject to numerous closing conditions, and is expected to close during Q1 2019. London-based GVA offers services which span the entire property life cycle from strategy and planning to delivery and management. The firm has 1,500 employees in 15 offices in the U.K., Ireland and Poland. GVA is also a founding member and majority shareholder of GVA Worldwide Ltd., an international organization of licensed affiliate commercial real estate companies with offices across 25 countries. “We couldn’t be more excited to welcome GVA to Avison Young,” said Mark E. Rose, chairman and CEO of Avison Young. “This is a transformational event that underpins our ambition and intent to significantly expand our footprint in Europe and beyond. 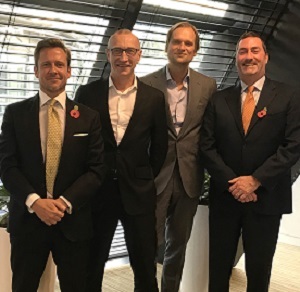 “Avison Young’s U.K. business will now be a genuine challenger brand firmly established among the top commercial real estate advisors in the U.K., North America and the world. This acquisition adds gravitas, weight, coverage and profile to our international operations as we continue to solidify our global platform while preserving our culture as a principal-led company. Avison Young has 2,700 employees in 85 offices in Canada, the U.S., Mexico, the U.K., Germany, Romania and Korea. The acquisition will add 1,500 real estate professionals in 15 offices in the U.K, Ireland and Poland. Including GVA Worldwide, the combined operations will have 5,000-plus professionals in more than 120 offices across 25 countries. “We are incredibly impressed with the strategic positioning of GVA, represented by its depth of consultancy and transactional services and long-standing client relationships,” Rose said in the release. “We are excited by the international collaboration potential and the opportunity to continue to build our unique partnership model. GVA operates 25 business units across multiple sectors: planning, development and regeneration; land and development; business rates; valuation consultancy; telecommunications; restructuring and recovery; energy and natural resources; lease consultancy; corporate solutions; health; GVA Worldwide; GVA Poland; Second London Wall project management; building consultancy; rights of light; investment; retail, hotels and leisure; offices; London agency and investment; industrial and distribution; automotive and roadside; property management; workplace consultancy; West End management; and asset management. “We are thrilled to have found the perfect long-term home for GVA in Avison Young, which is committed to continuing the growth strategy that GVA embarked on under EQT ownership,” said Andreas Aschenbrenner, partner at EQT Partners and investment advisor to EQT, in the release. GVA has a broad customer portfolio of clients including U.K. public institutions, multi-national corporations, major space users, developers, owners, lenders and investors. The combined operations of Avison Young will have 19 offices and 1,600 employees in the U.K.
“Our approach to growth in the U.K. continues to be both disruptive and holistic,” adds Jason Sibthorpe, Avison Young principal and U.K. managing director, in the release. “We intend to continue to invest, and we see great opportunity for further growth in all areas, particularly in the transactional space. The acquisition and a refinancing of AY’s capital structure will be funded through a combination of cash on hand, a committed financing from Credit Suisse, and additional common equity. This includes participation by Caisse de dépôt et placement du Québec (CDPQ) and Avison Young’s existing employees as well as issuance of shares to GVA employees, who will become Avison Young principals and certain other GVA employees. The company says it has ample capital to further invest in its global growth. The acquisition follows Avison Young’s announcement on July 16 that CDPQ made a $250-million preferred equity investment to accelerate AY’s strategic growth plan. Avison Young made its first investment under its partnership with CDPQ by acquiring U.K. firm Wilkinson Williams LLP and opening a new office in London’s West End on Aug. 1. On Oct. 10, Avison Young opened its first Asian office in Seoul, South Korea, with 63 members joining from Mate Plus Advisors Co. Ltd.
Avison Young is the world’s fastest-growing commercial real estate services firm. Founded in 1978, the company’s 85 offices provide value-added, client-centric investment sales, leasing, advisory, management, financing and mortgage placement services to owners and occupiers of office, retail, industrial, multi-family and hospitality properties. EQT manages approximately $50 billion Cdn in raised capital across 27 funds. EQT funds have portfolio companies in Europe, Asia and the U.S. with total sales of more than $28 billion and approximately 110,000 employees.